Having entered into unknown territory I decided to avail of my ignorance in the face of such a large topic and I decided to simply glance at the Earth as if I had never seen it before - I suppose to try to find some kind of 'key' that may reveal itself to a fresh eye. It was 6:00 am at this stage and it was still too early to find anywhere to go online or to call someone ( friends that I knew had studied geology ). So, with a few hours to kill, I sifted through my bookshelf. I found a pocket dictionary of geography that I had picked up somewhere along the way in my travels, probably in Asia, as the world maps centered on the Pacific. In this book there were basic maps of the fault lines and plates of the sea-beds and the areas of volcanic activity. 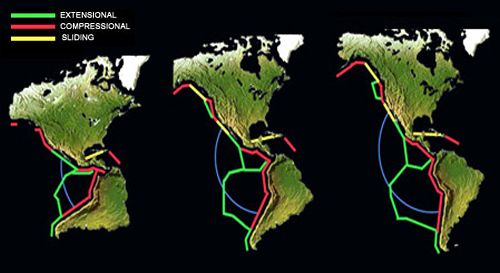 I found that the positioning of extensional and compressional fault lines in Central America supported my idea of closing North and South America, the configuration of the three plates of Central America acting like a hinge.